I began introducing my young tomato plants to the cool, cruel world late yesterday (May 19) afternoon. I planted the seeds in cups of sterile starting mix on April 25. Seedlings of the different varieties pushed through the soil about a week later. At about two weeks I used scissors to snip off all but one plant per cup. Now about 3½ weeks after I planted seeds, the healthy young plants vary in height. Yellow Plums are about 3 inches. Brandywines are 3½. Sungolds are 4. Big Beefs are 5. Now it’s time to harden them off. The seedlings ‘til now have had a pampered life—something like a Pampered human baby. They’ve been in the comfy environment of our utility room—a constant 72°F., no wind or rain to knock them over, the consistent glow of cool white fluorescent bulbs hanging just two inches above them. Now it’s time to introduce them to reality—direct sunshine, intermittent clouds, May breezes, and temperatures zipping up and down. This introduction is called hardening off—getting them used to life outdoors. So I’ve moved the plants from under the fluorescents downstairs into plastic storage bins and then to our front porch, which is on the east side of our house where they’ll get some morning sun but more afternoon shade. The plants will spend the next couple of days near the side of our house, which, I hope, will moderate nighttime temperatures and protect them a bit from strong winds. They’ll get a few hours of direct sun in the morning and then a lot of bright but indirect afternoon light—not enough, I hope, to sunburn them and turn their leaves white. I’m just not ready to buy sunblock for tender leaves. The May breezes will be to the plants what exercise is to us humans. They’ll help toughen their stems and tender leaves, just as working in our gardens firms up our muscles. Beginning next Sunday or Monday, I’ll gradually move the plants farther out from the house, about an additional foot each day, so they’ll get an increasing amount of direct sunlight and more exposure to spring breezes. If all goes well, by Memorial Day weekend (May 29-31), weather permitting, I’ll transplant them into our garden. 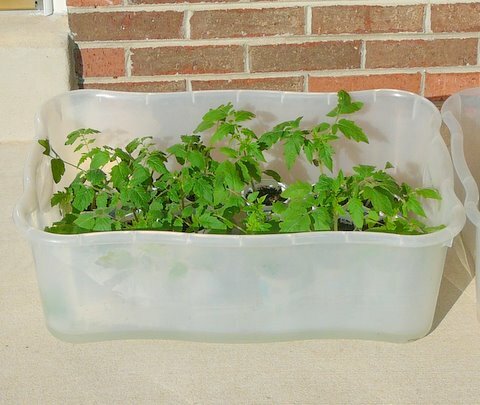 Why didn’t I do this two or three weeks ago—when the big-box stores were advertising specials on ready-to-plant tomato seedlings? Well, if you’re a beginning gardener, you need to know some facts of tomato life. They’re native to the western coast of South America and are semi-tropical plants that don’t like cold. Rule of thumb is to plant them when the soil temperature is 55° to 60°. My plan is to transplant them when nighttime temperatures don’t drop much below 55°. Last night it was 50° here at our place. By next week the temperatures at night should be 55° or above. Then I’ll set my tomatoes in the garden, and they will thrive. They won’t sit there unprotected through 40° degree nights at risk of “cold damage” for several weeks until warmer weather spurs their growth. But maybe you live in town, near a city, or in another area where nighttime temperatures already are high enough for you to set out tomatoes. If so, happy planting. And if you’ve been thinking you’re too late to plant tomatoes this year, relax. You’ve got plenty of time to buy plants, and the next couple of weeks will be the near-perfect time to introduce them to your garden.